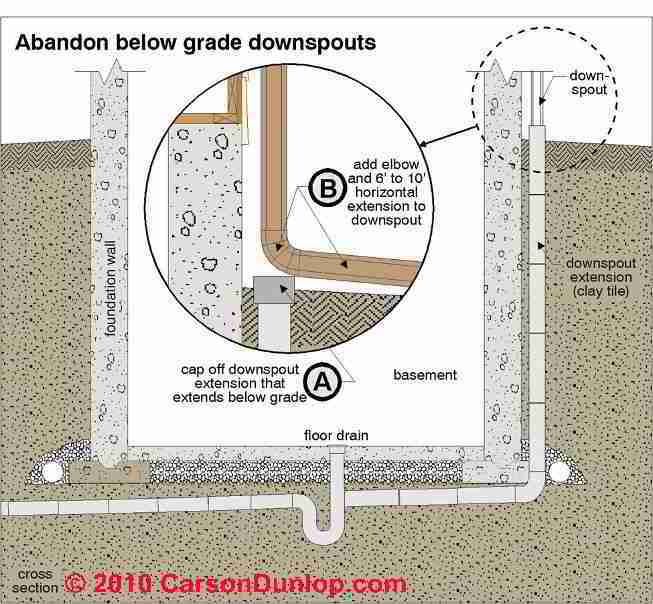 This article describes problems that occur in buried downspuout or roof leader drains, including broken or clogged lines that cause basement flooding. This article series discusses how to choose, install, diagnose & maintain roof gutters & downspouts, & roof drainage systems to prevent building leaks and water entry. 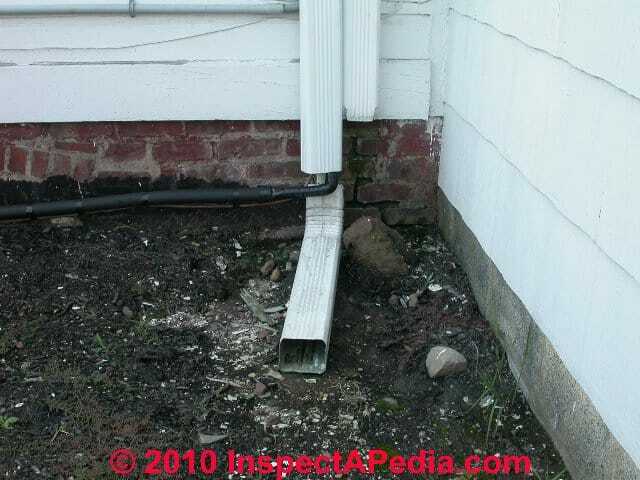 The buried downspout drain line shown at left is one that we'd recommend abandoning - it connects to a drain line that enters the building through the foundation wall and passes below the basement floor, incorporating a basement floor drain, ultimately connecting the the sewer line. 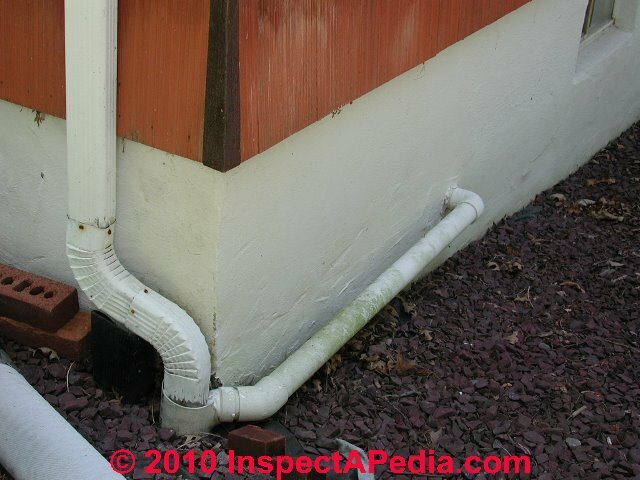 Buried or below-grade downspout extensions in new construction are (or should be) directed either to "daylight" downhill from the structure so that water will drain away from the building by gravity, or they are connected to a storm drain. For flat sites it may be necessary to drain into a drywell or "French drain" system or into a pumping chamber that sends drainage to a remote storm drain or drywell. See FRENCH DRAINS for details of handling roof runoff at flat or poorly-drained sites. The roof gutters were overflowing, sending water down and behind vinyl siding - you can see water pouring out of the "J" channel at the center of our picture of this Pawling New York Home. The ground under the deck was lower than surrounding soils (the deck was constructed before final backfill and grading were performed), forming a "pool" of water against the building rear foundation wall. These conditions are likely to lead to basement flooding, if not immediately, as soon as the footing drains clog or a crack opens in the poured concrete foundation wall. The sketch at left illustrates several reasons why it's a bad practice to connect roof drainage downspouts to drains that run through the building or under the building floors. Clogs in the vertical section of the downspout can lead to leaks through the building foundation wall. Debris flowing down the downspout drain (leaves from gutters) can block floor drains or even the main building sewer line, leading to sewage backups into the structure. 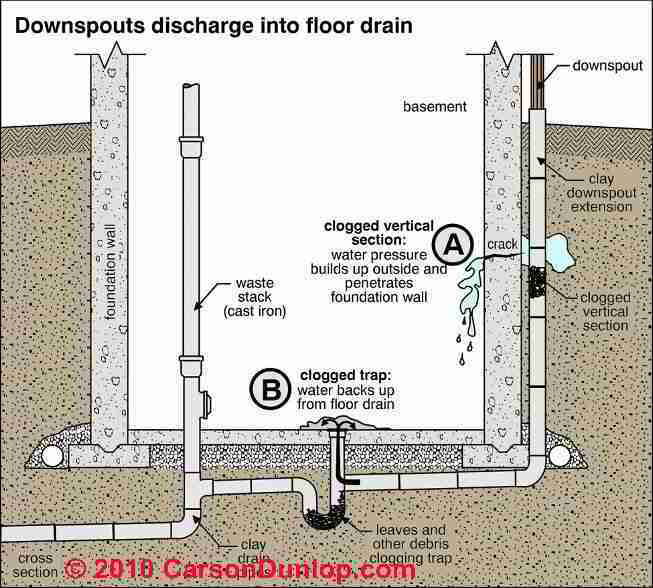 Debris flowing down a downspout drain that has been (foolishly) connected to the building foundation drain system can block that drain leading to basement flooding from either roof runoff or surface and subsurface runoff, or both. Some builders consider that if they use perforated 4" drain pipes to transport roof drainage away from the building, the water will "soakaway" harmlessly into the soil even if the end of the buried drain line is blocked or never taken to daylight. Both of those are mistakes. Perforated buried drain lines near the building allow roof spillage to leak against and into the foundation wall. If the downspout line end is not taken to daylight where water can continue draining away from the building (or to a storm sewer), the blocked line will eventually back up in times of heavy rainfall or wet soils, leading to building leaks and water entry. If we see perforated drain lines close to the building (photo at left) we expect that the building will eventually have a basement water entry problem. A "fix" for this problem is to abandon the buried drain line entirely. 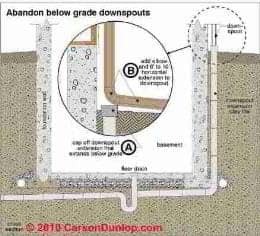 See Buried or "Below Grade" Downspouts for more notes on abandoning buried drain lines. Buried aluminum downspouts (photo, below left) corrode through and leak fairly quickly as the aluminum metal is thin and when exposed to corrosive soils or even acidic water from leaves and vegetation (or salt from ice-melts used nearby) the material will be damaged. The results are hidden leaks below ground that lead to basement or crawl space water entry. A better design uses plastic for buried downspout lines; the plastic should be solid piping and should be brought above grade for the downspout connection (photo, above right). 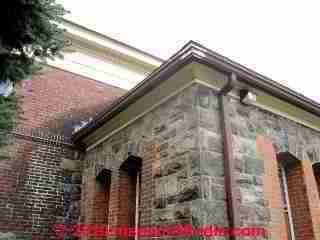 As our photo illustrates (left) it is usually a mistake to connect a downspout line to a buried pipe that is too small - in this case obviously smaller than the downspout drain itself. In periods of heavy rain the small-diameter plastic pipe shown here won't handle the volume of water running off of the roof. 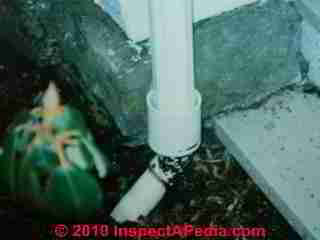 On occasion we find that a buried downspout line has been used to dispose of basement or crawl space sump pump water. That's probably fine. 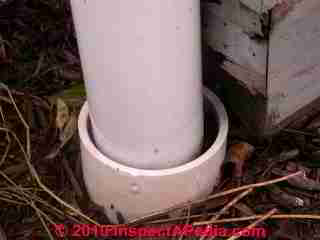 But don't use your buried downspout line to dispose of graywater from sinks, laundry systems, or showers. In most communities it is illegal to dispose of gray water on to the soil surface or into nearby waterways. 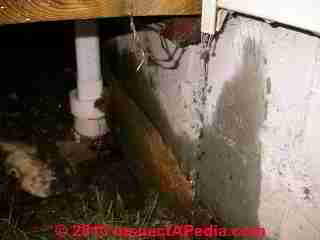 Our photo (left) shows a basement sump pump drain line connected to a buried downspout drain. 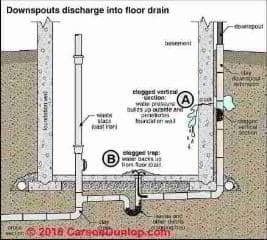 And be sure that the buried downspout drain line that you are using to carry off sump pump water is properly installed and that it is not connected to the building footing drains. Watch out: We have found buildings whose sump pumps were busily pumping away trying to get rid of basement water while discharging the water to an improperly installed drain that simply sent the water right back into the footing drain and right back into the basement. Don't mistake as part of the roof drainage system an aluminum downspout that has been used as a cosmetic cover for HVAC refrigerant lines as we illustrate in our photo at below left. Some A/C installers use an aluminum downspout to cover the refrigerant and condensate lines that are routed from an attic-mounted air handler down to an outdoor ground-level compressor. 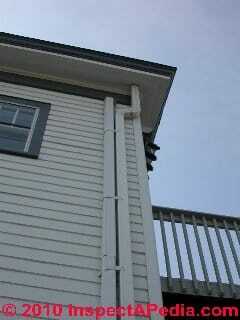 But do not use downspout materials as electrical conduit. 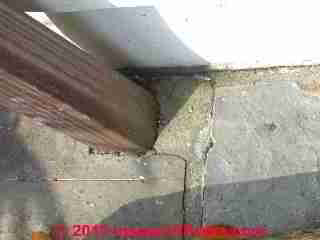 In our second photo of downspout materials used to cover air conditioning refrigerant piping (above right), notice that the extension and elbow on the water-carrying downspout (the right-most downspout of this pair) has fallen off and we have a splash area on the ground at an "inside foundation corner" - conditions likely to cause basement water entry. Continue reading at GUTTER DEFECTS LIST or select a topic from closely-related articles below, or see our complete INDEX to RELATED ARTICLES below. 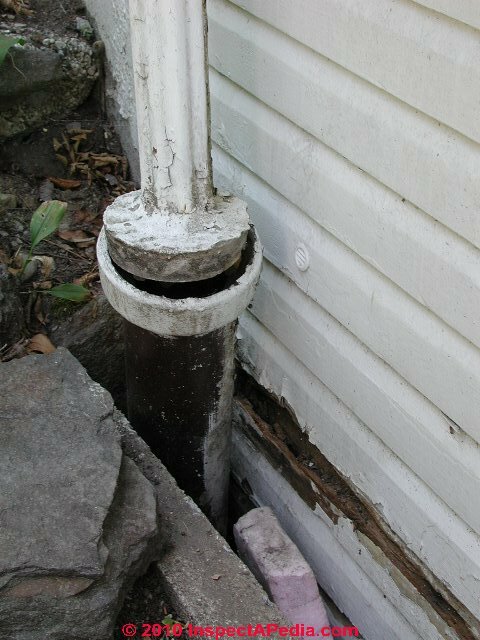 Also see DOWNSPOUT LEAKS or start this topic at DOWNSPOUT / LEADER DEFECTS; also see GUTTER DEFECTS LIST for other sources of wet basements or crawl spaces caused by problems with the roof drainage system. CONNECT DOWNSPOUTS to BUILDING DRAINS? 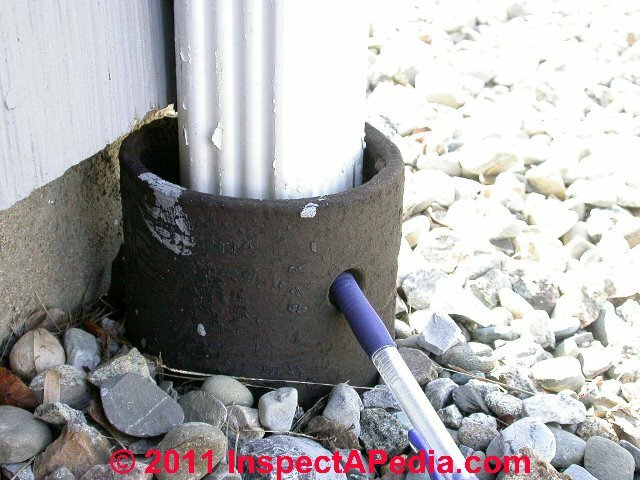 DOWNSPOUTS BURIED / BELOW GRADE at InspectApedia.com - online encyclopedia of building & environmental inspection, testing, diagnosis, repair, & problem prevention advice.